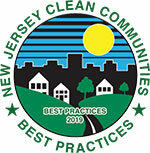 Best Practices is an incredible resource for Clean Communities Coordinators, a clearinghouse of information that incorporates general information about the Clean Communities program, examples of model programs, creative ideas and vendor lists. Best Practices is a “tool of the trade” and an integral part of the NJCCC/Rutgers OCPE training program for coordinators. The New Jersey Clean Communities Council is deeply grateful to the team of coordinators who share their time and talent in pursuit of quality education for coordinators.